But despite my love for Roadhog, I’ve still feel like I don’t quite know him. To fans, Dva is a Cheeto-snacking gamer brat, Zarya is an emblem of homosexuality in Russia, Soldier 76 is the absent father and Tracer is.... butts? What is Roadhog, or what could he have been? Beneath Roadhog’s terrifying spiked armor is a molten core of sadness. 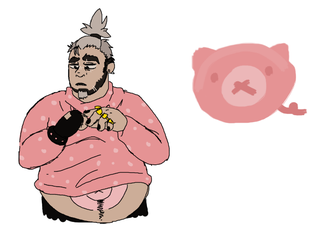 An Overwatch fan named Yazzdonut searched that molten core for vestiges of Roadhog’s humanity and unearthed emo, teenaged Roadhog, complete with black nail polish, gagues, dyed hair, hoodies and his twiggy boyfriend, Junkrat. After their headcannon proliferated widely throughout the Tumblr realm, other fans followed, clearly resonating with emo, teen Roadhog. Below is a sampling of fans’ darling, one-man apocalypse, never again to be taken seriously outside of Warped Tour.